So before we get into this post about planners, let’s just take a moment for a little something called irony. I’m usually pretty good about posting on a regular schedule (every Tuesday and Friday), which is often a result of planning well. Yet, as fate would have it, this post is a day late. Yes, the post about planners and using them to get organized and get things done on time is late. Irony. That being said, this is quite possibly one of the posts I’ve been most excited to write. I freakin’ love planners. My whole life is organized in my planners (yeah, plural), and it’s a huge part of how I manage to balance all of the different aspects of my life at once. However, there are a ton of different planners to choose from. I’ve actually used a number of different planners over the years, so I have a pretty nice grasp on how each planner system works. I feel like these are the standard fare as far as planners go – I used them all throughout high school and my freshman year of college. They’ve got a pretty standard monthly and weekly display with plenty of room to write in meetings and assignments. I usually divided each day into a column of tasks that needed to get done and a column of meetings/plans, but I’ve seen these arranged in so many different ways. If you’re a no-frills kind of gal when it comes to your planner or if you’ve somehow made it this far in life without a planner (I’m impressed honestly) and want to dip your toes in, one of these is your best bet. The customizable covers on these are the absolute greatest. Not only can you get your name/monogram on them, but you can switch covers to suit your fancy. I had a Life Planner sophomore year, and I adored being able to switch between the three covers I had for it – it feels like a whole new planner! 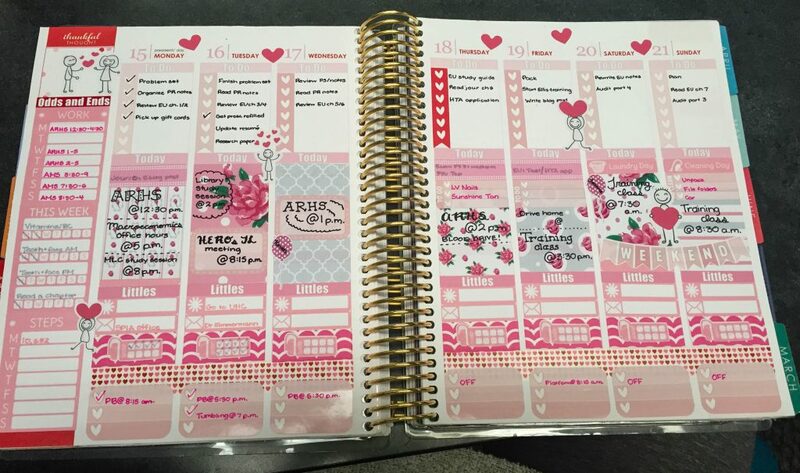 The inside of the Life Planner has a standard monthly layout, and the weekly display gives each day a vertical column with three sections. These sections are unlabeled, so you can really divide them up however you want. I’ve seen people do morning, afternoon, and evening, I’ve seen people do to-do, today, and little things, and I’ve seen people divide it up by topic. Personally, I went the sticker route, and went full-force into Etsy planner stickers to decorate the living daylights out of my planner. That was, however, incredibly expensive, so unless you’re in the mood to blow an extra $40 or so per month, stick to writing on the page and using stickers sparingly rather than on every spare inch of space. 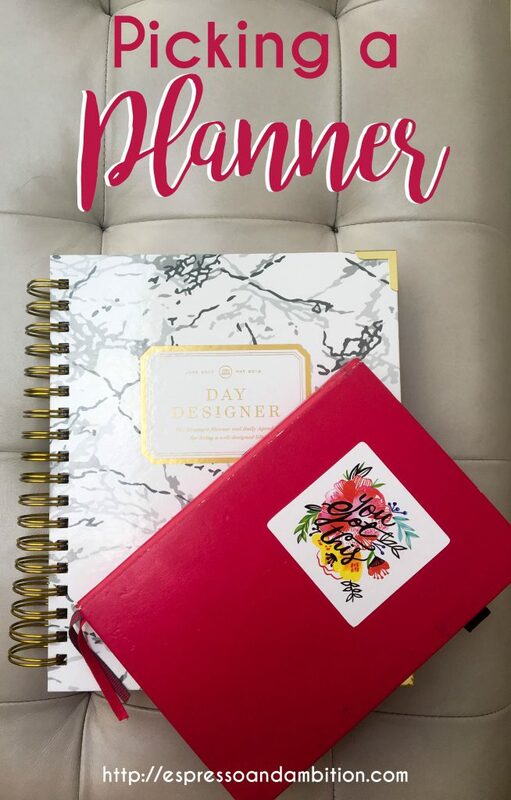 As someone who enjoys really getting into the weeds with planning out her day, a Day Designer planner is so perfect. I used this planner for my fall semester last year, but it was a bit too bulky to come to Oxford with me – I’ve bought a new one for this upcoming school year though. Instead of a weekly display, each day gets an entire page and you can plan your day down to the hour. There’s a huge space for to-do lists, and the top of the page features a “top three,” along with small spots for “due,” “dollars,” “dinner,” and “don’t forget.” If you’re a super-detail-oriented person, this is an amazing planner for getting anything and everything written down. I’ve already written two posts about my bullet journal (you can find those here and here). It’s the ultimate customizable planner and you can fill the pages with whatever you wish, from a traditional planner layout to meal planning to anything in between. It’s also the most cost-effective option out of all of these, because all you really need is a plain notebook and some pens (and a ruler doesn’t hurt). PS: I’ll still be using my bullet journal even though I just got a Day Designer, I’ll just be formatting it a little differently. Keep an eye out for another update! While I will eternally be an advocate of paper planners (they’re just so satisfying), there’s some situations in which using a paper planner just isn’t feasible and using an online calendar makes sense. If you’re the type of person whose schedule changes like crazy or if you’re balancing a bunch of different schedules simultaneously, sorting everything out via Google Calendar may be preferable. It’s easy to edit and color code, and you can get push notifications for certain events if you think you’ll need a reminder. There’s no one planner that I’m recommending above all others, because I really think that the best planner depends entirely on what you want to use a planner for. If you’re a super-detailed person, the best planner for you will be totally different than the best planner for someone who really only needs a place to write assignment due dates. Just pick which of these formats best fits what you’re looking for and what you need. I recently decided I wanted to start a bullet journal, so it’s nice to see a journal recommendation. I like how the one you linked already has squares drawn in it! The squared paper is seriously so helpful! I’ve wanted to try bullet journaling for so long. I just don’t know that I’m creative enough for it and I love when planners are already decorated. Lol. Just ordered a new one from Michael’s because mine is looking rough.